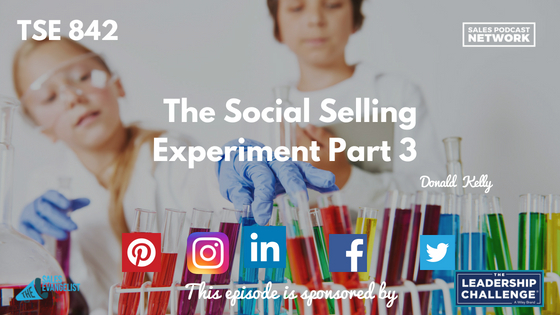 If you’ve been with us for the last couple of weeks, you know that we’re in the middle of a social selling experiment to determine whether connecting on social media improves our sales outcomes. Today’s episode of The Sales Evangelist will update our findings, and address a change we made in our program, as well as the reason for the change. If you haven’t been with us for the last couple of weeks, we’re using traditional sales techniques such as phone, email and snail mail to connect with 40 prospects. 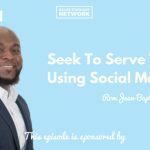 At the same time, we’re connecting with 40 other prospects using all the traditional means, plus social media connections as well. Over the course of the experiment, we’re reporting our findings to you so you can see the effects without conducting your own experiment. Over the past two weeks of the experiment, I stumbled onto the realization that I’ll need more time than I originally thought to build effective connections on social media. 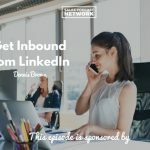 Because some of our prospects don’t check their LinkedIn accounts every day, the connections we make often take more time than we might have assumed. As a result, we’ve determined that our ramp-up period for social selling will be longer than we originally planned. Because of that, we don’t want to continue doing things that aren’t working. Instead, we’ll adjust our plan to allow for the new discovery we made. We realized that we aren’t the center of our prospects’ world, and they have obligations that prevent them from getting back to us right away. We pivoted to increase the odds that we’ll connect with our prospects. It’s about your Dream 100 list; your list of vetted prospects that would be ideal customers for you. Your goal is to capture their attention, and the best way to do that is through personalized contact. Personally connecting with your ideal prospects takes a great deal of work, but calling hundreds of prospects does, too. Your Dream 100 clients are an ideal fit. Your goal should be to find the key contacts, get information and phone numbers from the website, and learn a little bit about them. Then you can determine what problems they’re trying to solve and address them specifically. Receptionists and assistants have a lot of information about the decision-makers you’re trying to reach, as well as the organization you’re pursuing. Stu recommends that we recruit those gate-keepers onto our team so they’ll help us influence the decision-makers. As part of the experiment, we contacted the executive assistants who were connected to our decision-makers, and figured out the problems they were trying to solve. Once we had that information, we put together a package for each of the prospects we were targeting. There was a ticket-shaped note with a hand-written message, along with popcorn, and a specific candy and drink. The whole package cost us about $10 per lead, but the ROI will be significant because it could net anywhere from $1,000 to $10,000. After the packages are mailed, we’ll follow up with phone calls and emails. We’ll also send gift cards to the executive assistants to thank them for their help and to recruit them to our effort. We’ll couple all of this with our social media efforts as a way to connect with decision-makers. In the weeks to come, we’ll also update you on some new tools to help you find prospects and gather information about them.